In verifying our latest software release for LANforge, I wanted an independent way to verify and measure the jitter imposed on a wanlink. There are many ways to accomplish this, but here is a summary of my procedure. The network topology I used was two computers each with a network interface connected to the other through a switch. Each computer is running the LANforge software, so I was able to create a wanlink on one interface so that the latency and jitter impairments would affect packets leaving that interface. To synchronize the clocks, I used ntpd on one system and ntpdate on the other. I initiated the wireshark captures from the LANforge Port Manager, but could have also used tshark to do this. The UDP traffic was a one-way 56Kbps connection from eth1 on one system to the virtual interface behind the wanlink on the other system. The connection ran for about 180 seconds while I varied the jitter frequency on the wanlink. It uses tshark, bc, gnuplot and qiv. It could probably be cleaned up, but the jitter estimate appears to be accurate. 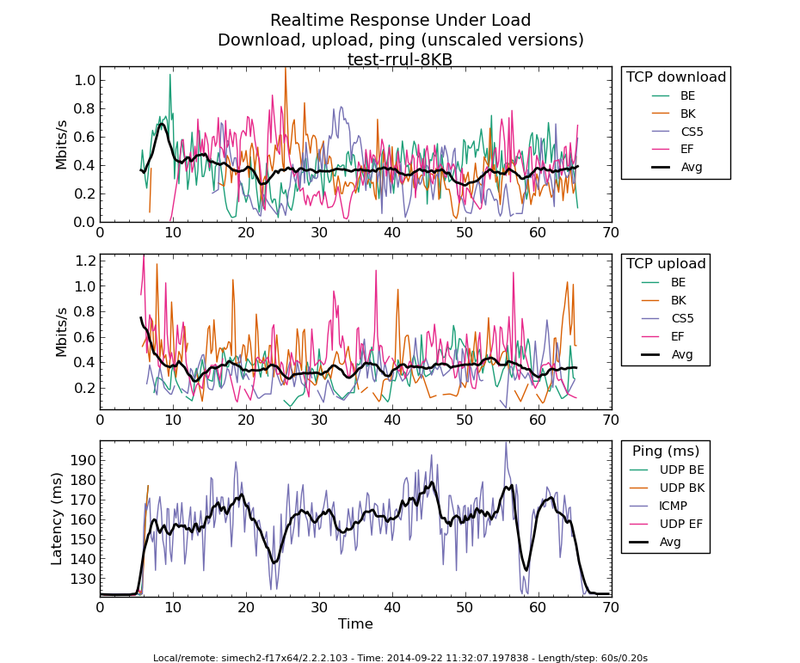 The next steps for improving this jitter measurement would be to incorporate a sequence number check to look for drops and a latency measurement to get a more detailed evaluation of the impairments setup on the wanlink. It makes use of the lanforge protocol as decoded by wireshark to acquire and verify sequence numbers. This shows that the capture files verify that there is about a 17ms baseline delay due to the 7ms serialization delay and 10ms additional delay setup on the wanlink. As I increased the jitter frequency, more packets experienced the 100ms jitter. LANforge-ICE can be setup to be a controlled emulated network with impairments to demonstrate the effect of buffer sizes on network traffic and model the types of networks seen in the real world. Here is an example using netperf-wrapper as the traffic source. Below is the network under test…created with LANforge-ICE. 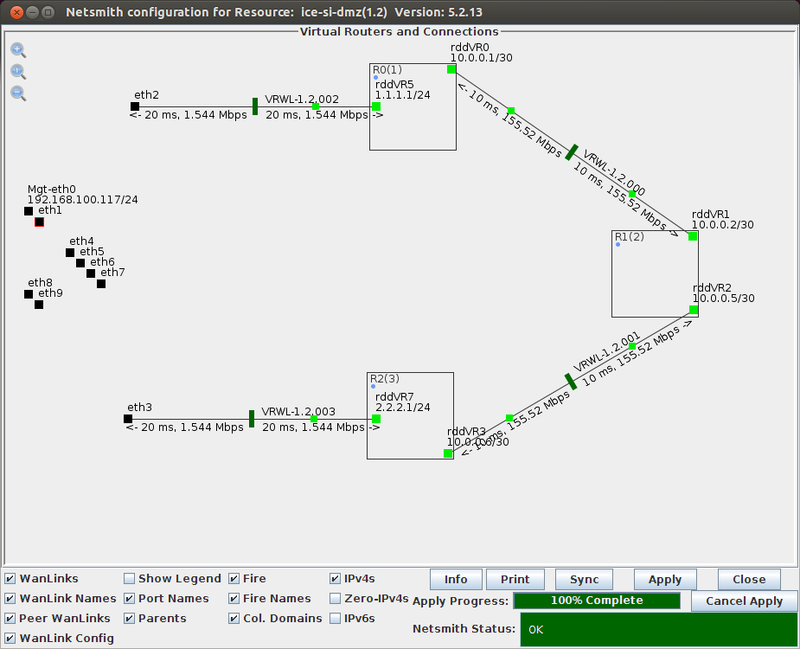 The two physical interfaces eth2 and eth3 are connected together with an emulated network consisting of a T1 link to a series of three routers with OC3 links between them. 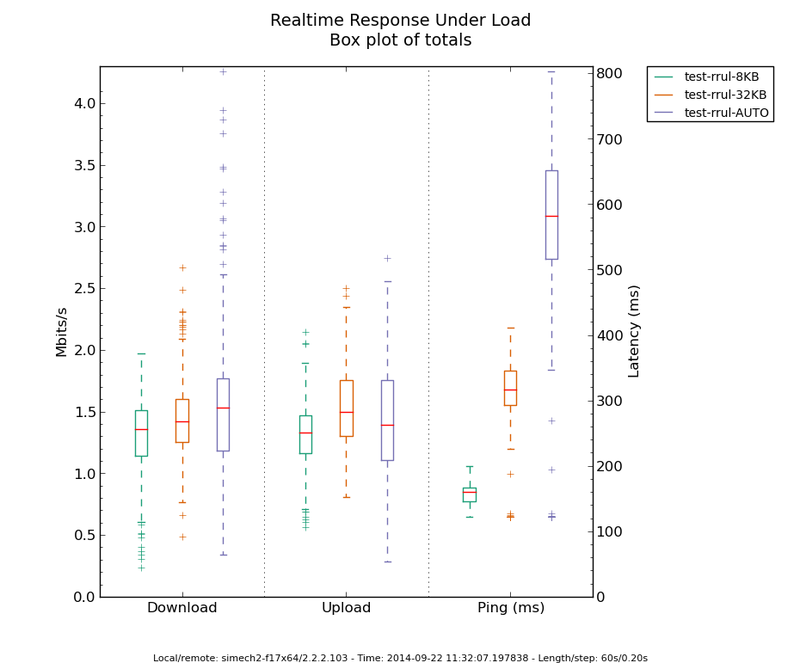 Each T1 wanlink is configured with 40ms of round-trip latency and each OC3 wanlink has 20ms of round-trip latency so that a ping from eth2 to eth3 on the traffic source machine shows about 122ms round-trip latency through the emulated network. PING 2.2.2.103 (2.2.2.103) from 1.1.1.102 eth2: 56(84) bytes of data. 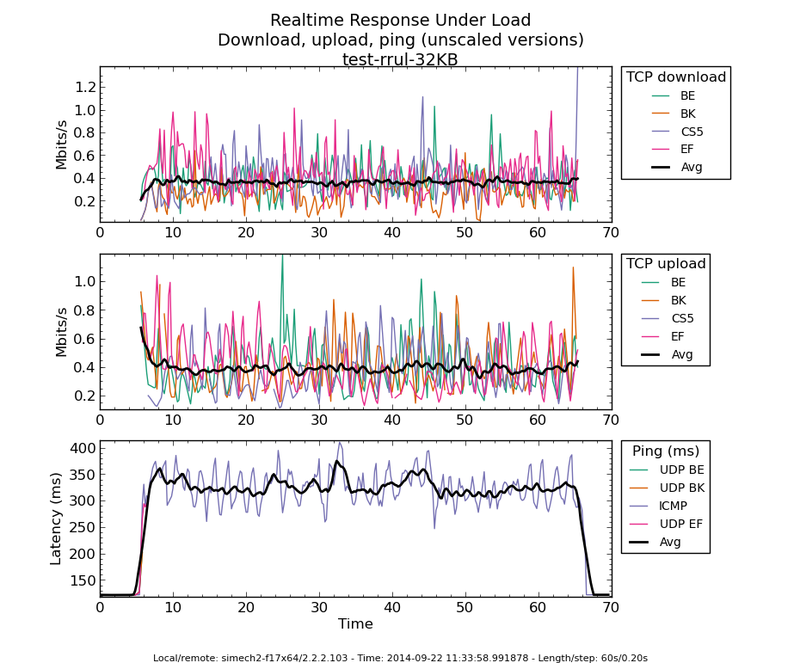 Between each netperf-wrapper run, the backlog buffers on the T1 wanlinks were modified to demonstrate the effect of buffer size in the network. All interfaces in this example have the default tx queue length set to 1000 packets. The buffer sizes used were small at 8KB, large at 32KB and auto-sized which resulted in about 80KB backlog buffer. Results are shown as combined box totals and combined totals for all three test runs. Links to json.gz files are at the bottom of the post. Results with small 8KB buffers. Results with large 32KB buffers. Results as combined box totals. www.candelatech.com for more information on LANforge features. github.com/tohojo/netperf-wrapper for more information on Netperf-Wrapper.